Guest Post: A Do-It-Yourself Pancreas System. Necessity is the mother of invention, and in some cases, that necessity comes with a side of love. My dear friend Dana Lewis (who threatens to wash my mouth out with soap every time I curse) and her amazing boyfriend, Scott Leibrand, have created a “Do It Yourself Pancreas System” that is revolutionizing not only Dana’s diabetes confidence, but potentially changing the landscape of diabetes management for us all. Does that seem like too-big of a statement? Read for yourself and see what patient-led innovation can really accomplish. I took a deep breath, intentionally pulled out my pump, and bolused. He asked if it was a pager and we continued our conversation. That was our first date, and his first introduction to my diabetes. It wasn’t the big deal that I thought it would be. On our second date, I hated to drink the toddler sized juicy juice from my coat pocket when walking on the beach before dinner, but that wasn’t a big deal, either. He only asked if it was for low blood sugar. On our fourth date, when he opened his trunk to grab roller blades, I noticed a Costco-sized box of juice boxes. “I thought they might be good to keep in the car in case you run out of them in your purse,” he said. The next few months were filled with other surprising moments as Scott started learning about diabetes, not only from me, but also from the DOC. I loved when he started following some of my d-friends on Twitter and saw other perspectives on life with diabetes. I wasn’t sure what to think about all of this, though – especially because I was falling in love with someone for the first time, and it was with someone who was not only interested in understanding diabetes, but also in helping me find ways to make it easier. I joke about using Twitter partially so my family knows I’m alive, but it’s actually pretty true. I had shared with Scott what it was like living by myself and dealing with diabetes at night. I will sleep through any type of CGM alarm, even if I place it in a glass to amplify the audio of the alerts. I talked about wanting someone to be able to look remotely and see if I was alive based on CGM numbers. Scott and I started talking about other things we’d like to do, if only we could get the data off of my CGM in real time. Then late last year, I stumbled across John Costik on Twitter. He was talking about viewing his son’s CGM data remotely. I emailed Scott saying we should talk to John and build upon what he was doing … and Scott tweeted John before he even responded to my email! Thanks to John, we were able to upload my CGM data in real time. We created a system that would trigger custom CGM alerts to send to both me and Scott. If I wasn’t responding to CGM alarms and “snoozing” them in the system, Scott could see what my BG was and decide if he needed to call and check on me. If I was responding to alarms, he didn’t need to do anything except send e-hugs for lows. We added a feature to the system to plug in how much insulin was in my body and how many carbs I had eaten. This enables me to track my BGs after a meal more accurately, and project if I am likely to go high or low. When my BGs come in higher or lower than estimated (for any reason), it shows me how far out of range I am projected to go and what I need to do to fix it (with an additional bolus for a projected high or using temp basals or carbs for an impending low). It also tell me how long I have before I drop below 80, to figure out if I have time to do a temp basal or if carbs are the best option to prevent a low. 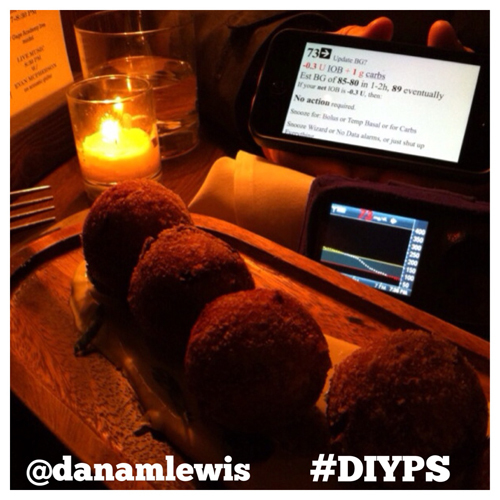 We started calling it the “do it yourself pancreas system”, or #DIYPS. 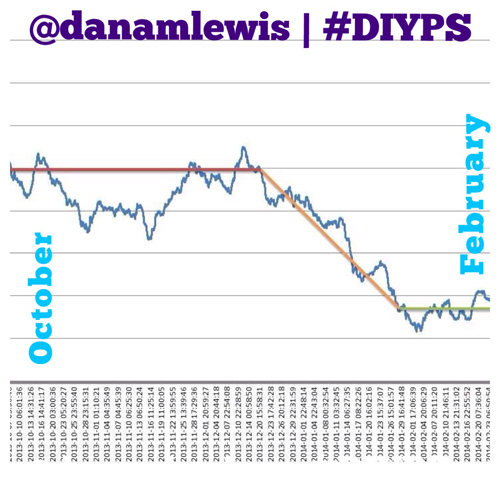 Before #DIYPS, it took more guessing to try to prevent or fix a low without causing a rebound. #DIYPS’s calculations help me reduce the extra carbs I use for lows by allowing me to more precisely use temp basals. It’s also brought my average blood sugar down and reduced total time spent high or low. You can see the difference from before I started using the system, and after, by looking at my 30-day trailing estimated average glucose (eAG). #DIYPS is especially helpful during those “oh no” (or something that involves soaping your mouth afterward) moments – like when you put in a new pump site and two hours later you get a “no delivery” alarm. I had this happen last week; my BGs were rising suddenly, I supposedly had insulin on board, but in reality my pump hadn’t been able to deliver my basal insulin for the last two hours, and the corrections hadn’t really gone into my body either. I didn’t know if any of the insulin had gone in or how high I was going to rise. Previously, I would have guessed and hoped for the best. With #DIYPS, I was able to use the system’s constant re-calculation of my data to safely give a big correction bolus to replace the un-delivered basals & boluses from the past two hours, and use it to come down to a safe level. In this case, I managed to level off flat in the mid-90s for the next few hours. Of course, this all had happened after midnight – so the other great benefit of #DIYPS in this situation was feeling like I could go to sleep safely. Even with a lot of insulin on board to correct this who-knows-how-high BG, I could trust #DIYPS to alarm and wake me up if I was projected to go out of range. You can read more about how #DIYPS works here (and why it’s not an artificial pancreas), and Scott’s perspective on it here. We’re not done, and we’re hoping to partner with folks who are interested in helping us build on the system. But we are not waiting until an artificial pancreas is out on the market to make the quality of life with diabetes better. 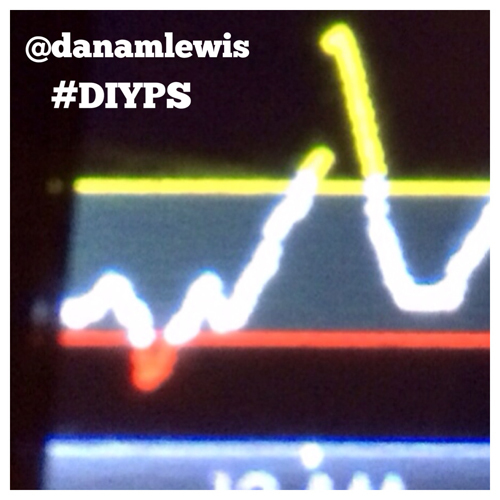 Right now, the #DIYPS user interface is pretty simple. But, my biased opinion is that it’s incredible – how can it not be when it gives me the peace of mind of being able to sleep safely at night? 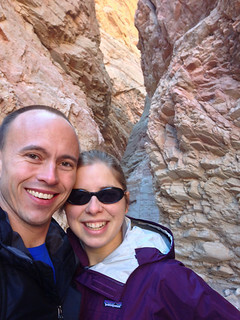 #DIYPS – and Scott – have also taught me that just because I can do something myself, doesn’t mean I have to. Yes, I can do all the calculations #DIYPS does, but I don’t have to spend as much time thinking about it now over the course of the day (although I do validate any action I take with my own assessment of my CGM data or BG reading). Reducing the cognitive load of diabetes means I have more time and energy to spend living my life. That’s something else to fall in love with. This is FANTASTIC!!! As if I wasn’t a huge fan of Dana already – now I am even more so!! Very impressive. Love diabetes DIY, exciting to see people take charge in such skilled ways. But why is it almost equally awesome in my mind that Dana is officially a blogger?! “Dana M. Lewis,” is an anagram for “I love blogging! !” Except without the exclamation points. This is an amazing story. If only we could find such partners in life..
Great example of what can come from our pancreatically-challenged minds when we decide to change the game for ourselves…Really hoping this connects even more dots with Tidepool and others who are grabbing the #WeAreNotWaiting wave. Down with the gatekeeper! Amazing what we can do for ourselves. I look forward to hearing a LOT more about this! As a single parent with two kids I’m responsible for, this has absolutely incredible implications for improved (and SAFE) overnight control. I love this article! Everything about it! Thank you! Kerri – thank you for sharing this! I had no idea that people were being this innovative! Now I need to sign up to twitter to follow this, this is amazing!